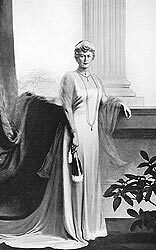 She was born in 1867 the only daughter of Francis, Duke of Teck and Princess Mary Adelaide of Cambridge, a grandaughter of George III. She was engaged to be married to the Duke of Clarence, who died of pneumonia within six weeks of the announcement. 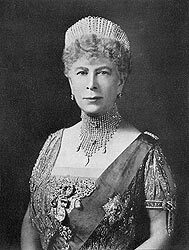 She later married his brother the Duke of York in 1893. After his accession to the throne (as King George V), in 1910 she accompanied him to Delhi as Empress of India, for the historically unique Coronation Durbar in December 1911. She was by nature rather stiff and reserved, however she was more sympathetic to changing habits than her husband, whom she helped to mould into a 'people's King'. 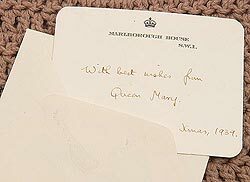 After the abdication of her eldest son, (Edward VIII) she once again continued to assist her second son (George VI) throughout his reign who she survived by thirteen months. She died on the 25th March 1953. 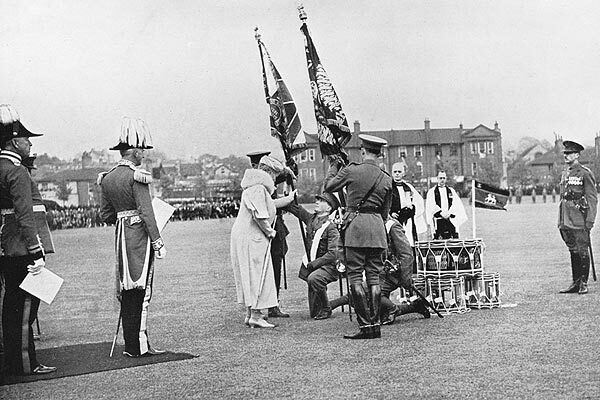 On the 11th of May, 1937, His Majesty King George VI appointed his mother, Her Majesty Queen Mary, to be Colonel-in-Chief of the Queen's Royal Regiment, a task which she undertook with characteristic sympathy and care. 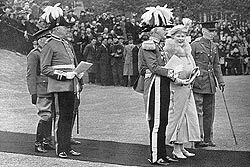 Until her death in 1953 Her Majesty concerned herself with intimate details of her Regiment to an extent not realized by all its members. 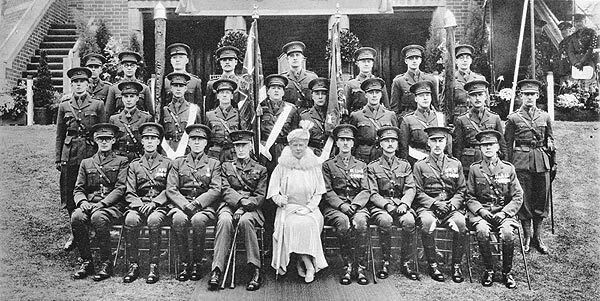 Whenever possible she visited the Battalions and the Depot, and when prevented by increasing age, she kept in close touch through the Colonel of the Regiment. 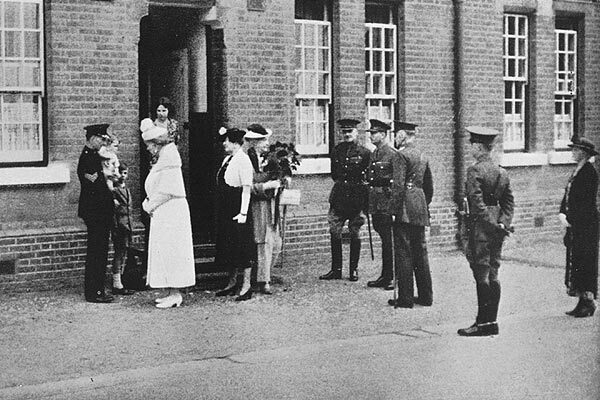 Her care for, and interest in her Regiment inspired great affection and respect. 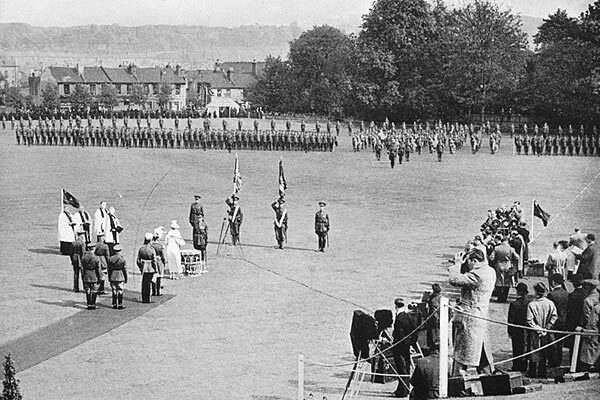 Queen Mary's visit to Depot, The Queen's Royal Regiment, Stoughton Barracks, Guildford. Throughout the 1939-45 war a very active Regimental Welfare Committee functioned under the chairmanship of Colonel GN Dyer. 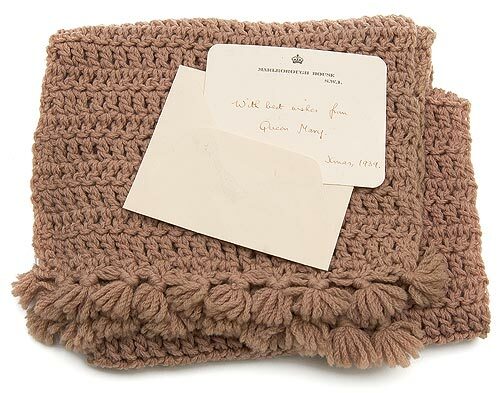 Over 90,000 knitted comforts were sent to the various Battalions of the Regiment, which included 106 scarves personally crocheted as gifts for officers by Her Majesty Queen Mary. 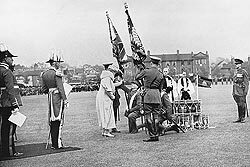 She also subscribed to the Regimental Welfare Fund, which assisted returning prisoners of war and dependants of men killed on active service.